The Bakersville Emporium operates in the Historic Greene Building. 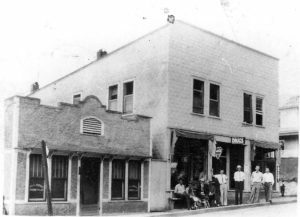 The Greene Building, which currently houses the Bakersville Emporium, was constructed on the site left vacant by the 1922 fire that destroyed part of Bakersville. The Green Building was constructed by David MacDonald Greene, who owned a big white two-story general merchandise where the Mitchell County Public Library is now. 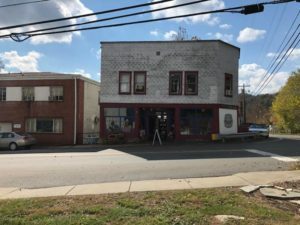 His son, James Franklin Greene, for years had a drug store, general merchandise, and furniture store in the Greene Building. 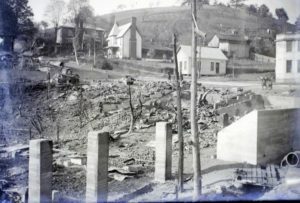 He and his wife lived in an apartment upstairs before moving to a brick house near Gouge School. 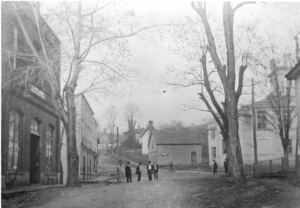 Frank’s wife was Ruth Baker, a descendant of David Baker, founder of Bakersville. Their children were James Paul Greene, Norma (Webb), and Ned Greene. In the 1940s, the City Drug Company was on the first floor. Doctor A.E. Gouge, Family Physician, had his office upstairs, in the rear, while Dr. W.B. Masters had his dentist office in the front upstairs. Next door was the law office of A.L. Greene. This photo shows, from left to right: man, boy, and dog unknown, Milton Anderson, unknown, D.E. Vinson Frank Greene—Owner, Richard Vinson—Druggist, Pete Greene, and youth unknown.